Oliva Advanced Hair & Skin Clinics is proud to announce the launch of New Technologies Intragen and Secret RF for effectively treating Loose Skin and Stretch Marks. 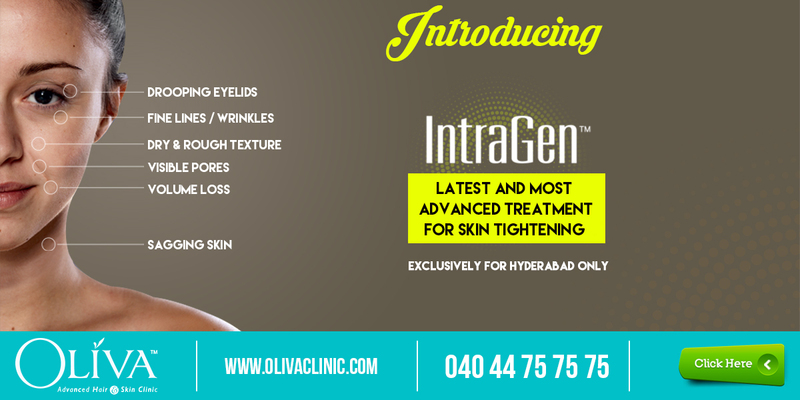 Oliva Clinics has taken yet another step in bringing the best and is delighted to present with New Technologies Intragen to treat Loose & Saggy Skin on face & neck and Secret RF for effective Stretch Marks Removal. Ageing is a process which cannot be stopped and with passing time, one can notice those signs catching up. Aging targets the face and neck first and the signs begin with drooping eyelids, wrinkles, fine lines, sagging skin, skin folds on the neck, and what not. In a world where visual appeal always has an edge, an apt solution needs to be worked out. If the right measures are taken, one can certainly prevail over prolonging the ageing signs. This forms the crux to the various services at Oliva Clinics. Experience the best as Oliva Clinics now bring the latest and most advanced treatment in skin tightening using Radio Frequency technology – the Intragen. This is USFDA approved as it meets the highest of safety standards along with effectiveness. Intragen has the ability to deal with loose skin on both face and neck. The fact that, this is a completely painless procedure and entirely natural with immediate visible results, adds more credence to the method. One need not worry about side effects because there are none. Oliva Clinics knows the value of time in today’s age and hence it chose this technology because there is no downtime and one can get back to work as soon as the procedure is done. Just four sessions in a whole year is all it takes on an average to get tightened and firm skin. Step into any of the centers of Oliva Clinics and be assured to rest all doubts on the loose skin after speaking to the expert cosmetic dermatologists. Get set for the gorgeous skin! There are those parts in the body which need some form of repair and usually it is the external ones which need attention because that determines the appearance and impression. Sometimes, they just need to be kept as a secret due to lack of a proper solution. A common problem faced by many is stretch marks which give a distorted look to body and tends to cause severe embarrassment in quite a few situations. No more need to keep the stretch marks a secret and suffer in silence. Oliva Clinics has always focused on those areas which pose a challenge to appearance and strived towards offering the perfect and most advanced solution. In lieu of that, Oliva Clinics is happy to present the Secret RF, the latest and most advanced treatment for stretch marks. This is a bipolar microneedling procedure which tackles the stretch marks internally and ensures that upper skin doesn’t get affected. Secret RF is the most effective, precise and advanced mechanism with very minimal downtime that ensures that embarrassing secret of stretch marks is gone forever. One needs to take time out for just four to eight sessions once a month and regain the original look. The best part is there would be no post procedure signs. So, just walk into any of the centers of Oliva Clinics, discuss with the expert cosmetic dermatologists, experience the magic of ‘Secret’ and walk out stretch free and stress free. Visit here https://www.olivaclinic.com/land/stretch-marks/ for Latest and Advanced Treatment for Stretch Marks. Visit here https://www.olivaclinic.com/land/skin-tightening/ for Latest and Advanced Treatment for Skin Tightening.